Size: These wasps measure 1.9 to 3.2 cm in length. Color: Their narrow bodies are most commonly dark brown in color, with black wings and yellow markings. Some even appear similar to yellow jackets in coloration. How Did I Get Paper Wasps? In North America alone, there are over 22 species of paper wasps. Worldwide, there are over 200 species. They enter homes through open windows and doors, or structural cracks. Since they prefer to live in sheltered areas, the pests easily find plenty spots for their nests in homes. How Serious Are Paper Wasps? Paper wasps are considered beneficial because they assist in pollination by feeding on nectar, and they control pest insect populations by feeding them to their larvae. However, despite their ecological benefits, paper wasp nests should not be permitted to develop in or near the home. Stings from paper wasps are extremely painful and may produce serious reactions to people who are allergic to the venom. Homeowners typically have issues with paper wasps when they accidentally disturb a hidden nest. While honey bees can only sting once, wasps will strike as many times as it takes to ward off intruders. Most reactions to paper wasp stings are mild, but some people may be allergic to the pest's venom. Removing a paper wasp nest may be dangerous. It is advised that a pest control professional be contacted to assist in treatment of paper wasp infestations. Your local Orkin technician is trained to help manage paper wasps and similar pests. Since every building or home is different, your Orkin technician will design a unique program for your situation. 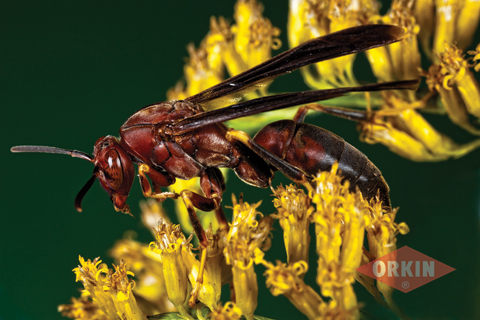 Orkin can provide the right solution to keep paper wasps in their place...out of your home, or business. These insects are called paper wasps due to the construction of their nests. Paper wasp nests are made from plant material combined with saliva and appear to be made from paper. Their nests include numerous compartments within which wasps lay their eggs and rear their young. They typically do not have an outer shell with the cells of the nest visible. In fact, it somewhat resembles an umbrella and is the reason they may be called umbrella wasps. Paper wasps feed on nectar and pollen, although they also hunt for insects such as caterpillars with which to nourish their colonies' larvae.